Doctor of Engineering (Computational Mechanics mention) from the National University of the Litoral, Santa Fe (2013). Master of Engineering Sciences by the Universidad Nacional del Nordeste, Chaco (2008). Civil Engineer from the Universidad Nacional del Nordeste, Chaco (2005). Hugo G. Castro, Rodrigo R. Paz “A time and space correlated turbulence synthesis method for Large Eddy Simulations”.Journal of Computational Physics, 235, pp. 742-763. ISSN: 0021-9991 (2013). Rodrigo R. Paz, Mario A. Storti, Lisandro D. Dalcín, Hugo G. Castro, Pablo A. Kler “FastMat: A C++ library for multi-index array computations”. Advances in Engineering Software, 54, pp. 38-48 ISSN: 0965-9978 (2012). Castro, H.G. ; Paz, R.R. 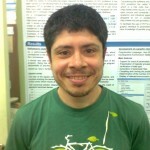 ; “A modified turbulence synthesis method for Large Eddy Simulations”, 10thWorld Congress on Computational Mechanics, San Pablo, Brazil (07/2012).